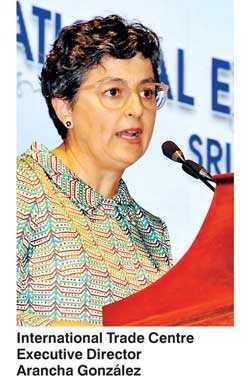 Strong commitment by the public and private sectors to increase capacity of local exports and improve trade performance and competitiveness augurs well for Sri Lanka to become a successful modern economy, believes International Trade Centre (ITC) Executive Director Arancha González, with the caveat that fast-pacing the effort would be crucial to success. “In my view, Sri Lanka is going in the right direction, but probably needs to accelerate the pace, because the world around this island nation is moving very fast. It is now time that the country becomes stronger at home, opens up to the rest of the world and invests in its citizens, who are Sri Lanka’s largest asset,” she told the Daily FT. In a world where technology is becoming critical, she insisted on the need to ensure all men and women in an economy are properly skilled today, to take up the jobs of tomorrow. “The biggest and the best recipe is to invest in your people’s education, creativity, ingenuity, innovation, and skills to allow Sri Lanka to succeed as an economy of the 21st century,” she added. As Sri Lanka is a small nation, González stressed that it cannot play in the league of big bulk products, and the focus should be more on higher value added, higher quality, smaller volume products, and services catering to niche markets, where SMEs can earn higher revenues for their products. “Cutting red tape and liberalising certain services essential for the smooth function of international trade is important. Help businesses get better intelligence, ensure that credit flows at affordable rates for the micro, small and medium enterprises (MSMEs), particularly to those at the base of the pyramid, to open market opportunities and ensure they can use this opportunity to generate more growth in the island,” she stated. Describing protectionism as a ‘disease’ spreading throughout the world, she said some countries are tempted to take trade protectionist measures to close their markets. “Invest in becoming more competitive, rather than shutting ourselves from international competitiveness, which will only make us boring. Taking trade protectionist measures is the wrong avenue to become competitive in the market,” González added. González also touched on the importance of enhancing rural communities, which are at the base of the pyramid, where the largest pockets of poverty and untapped potential exist in Sri Lanka. When rural communities fail to earn decent incomes they migrate to urban areas. “A big effort needs to be taken, not to bring these people to the urban areas, but to bring the urban areas to them. To help them get a decent income from where they are, to move from livelihood agriculture to agro-processing and to empower them to bring out the best of their abilities,” she stressed. She also said that ITC was helping Sri Lanka to draft its logistics regulation to become a hub that connects to the enormously growing economic powerhouse of Asia.